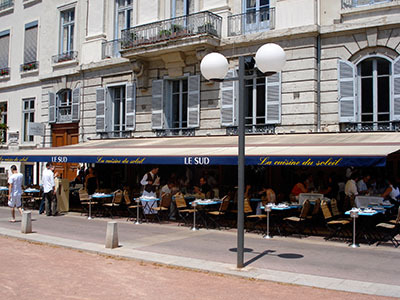 Le Sud is one of Paul Bocuse bistros located as its name in French indicates in the south of Lyon. 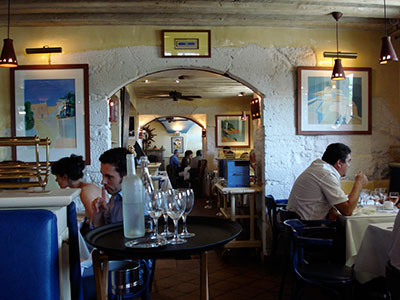 The restaurant is located near the city center and has a Mediterranean themed decor. While the restaurant is relatively comfortable, tables are very close to each other and you don’t get much space. The service was very good. It was fast and our waiter made genuine efforts to please us. 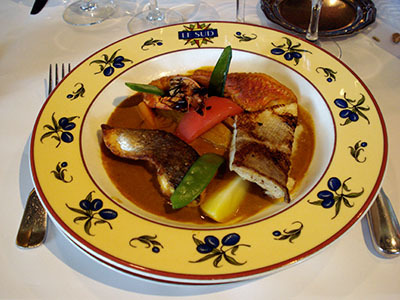 As main course I had fisherman plate, cooked bouillabaisse style with saffron. The fisherman plate, which use 3 kind of fish, gambas and vegetables (green beans and potatoes) was excellent. The fish was perfectly cooked, moist and tasty and the saffron sauce wasn’t overpowering the dish. The gambas as well were perfectly cooked. 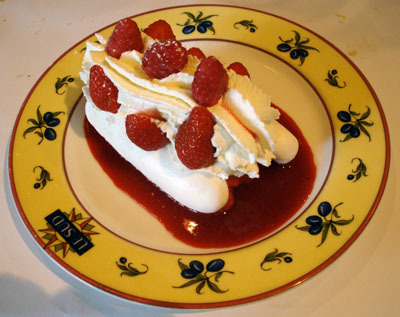 For desert, I had the vacherin (sorbet, strawberries, raspberries, meringue on a raspberry coulis). As the meringue bring the sweetness to the dessert, I would have preferred the sorbet to be a bit less sweet. Still it was really good. Around $40, including drinks (mineral water, espresso) and tip. Considering the restaurant, the location, the quality of the food and the current exchange rate (close to 1.6 dollars for 1 euro at the moment), you’re getting very good value for money. I will certainly come back. My mother, Anne Clark (author of The Frog/Commissary Cookbook) ate dinner there this evening and said it was divine! I’d love to go.